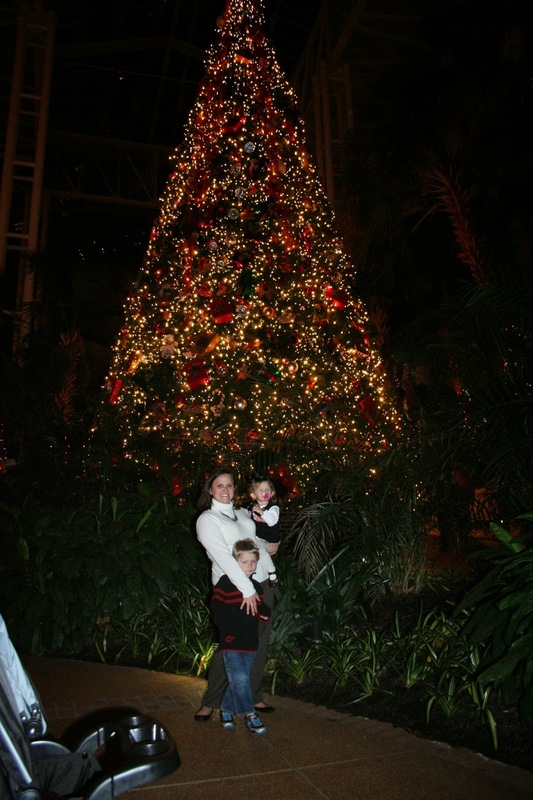 One of our family's favorite Christmas traditions is heading to Nashville to see the lights at Opryland Hotel. I know that as time passes we will likely transition away from many of our activities like the Polar Express, parades, etc. However, this is something I hope we continue to do as they grow older,and eventually include our future in-laws and grandchildren. Yesterday we headed to Nashville right after work. We have learned from experience that it is best to make the trip on December 23rd. Crowds are lights, parking is easy, and we don't have to rush back for work or school. It was pouring down rain when we got there which made the trek from the car to the hotel a nightmare, but it was totally worth it because the kids were elated when we got inside. Eli remembered a few things, but to Ellie it was all basically brand new. She literally stood up in her stroller pointing and clapping as we walked through the winter wonderland. The rain kept us from walking through the outdoor lights, but in hindsight that was probably best. Ellie got in her head that she needed to walk, so we had to strap her in the stroller. She was NOT a happy camper. Once she started acting ugly, we sped through the rest of the hotel at break neck speed. Ha! It wasn't exactly the romanic stroll we enjoyed in college. Oh well, we're making memories, ya'll! As much as we love Opryland, it's not exactly stroller friendly. There are soooo many stairs, which I never noticed until we had kids. Actually, I never noticed until we had a double stroller. The little umbrella strollers are easy to pick up, but not the monster we lug around now. After a few pictures, we trudged back through the rain using a golf umbrella because I couldn't find my good ones. Ha! We put Ellie in the stroller with a blanket over his head and more or less jogged the whole way back. You can imagine our dismay when we unloaded the minivan at Sir Pizza, shuffled the kids inside through the pouring rain only to be greeted by a hacking, snotty hostess...um, no thanks!! We made up some story about the kids being whiny and made a beeline for the door. Disappointed, we headed for Chili's. Ya'll, it was the WORST.EXPERIENCE. EVER!! After waiting five minutes for the hostess to get back from flirting with a guy at the bar, she told us to wait while she walked another group of men to their table. After more flirting, she returned with the whole posse following her?!?! She then tried to seat us, but we told her no. Next we drove around O'Charley's parking lot three time without finding a spot. Let's just say that we settled for Mexican. Ha! It was a crazy but wonderful night.